NEW YORK – Roger Federer and Rafael Nadal have been compared and contrasted through much of Federer’s career, and all of Nadal’s career. In the collective twilight of those remarkable runs, now simultaneous even if Federer is five years Nadal’s senior, they remain as different as two tennis players can be. On the second Friday at the US Open, Federer is competing in his 10th US Open semifinal in the last 12 years. Nadal has been home for a week, eliminated in the third round by the mercurial Fabio Fognini in a match he led two sets to love – the first time in his Grand Slam career he coughed up a lead of that magnitude. At 34, Federer continues to baffle those who have been predicting his imminent demise for years. He keeps proving them wrong, pushing back his expiry date to the point where it’s hardly ever a conversation any more. At 29, Nadal is struggling at a younger age than most might have expected but a not-unexpected age given how battered his body is. This season is the first season in more than a decade the Spaniard hasn’t won a major title. And the more time passes, the more the “solutions” he seeks seem just tantalizingly out of reach. The contrast, as it was in their primes, remains fascinating. Their essences remain consistent though and, in retrospect, offer plenty of clues about how this chapter might shake down. Federer was always the more outwardly confident one – arrogance, Federer non-fans would call it, imperiousness built over years of dominance and reverence. At this stage, he has lost little of that, at least publicly. On some level it may have enabled him to cheat Father Time, almost bluffing everyone including himself until he retooled for a final burnishing of his already stellar record. There’s an element of genetic luck there, obviously, of body type, that Nadal can’t claim. But Federer was in his 17th year before he even played a pro event outside Switzerland; Nadal was out there slogging away on clay at the Futures level when he was 14 and a half. Perhaps those early years have cut some years off the back end of his career. We’ll never know. The Spaniard, at least outwardly, has rarely been confident, and never imperious. When he struggles, he’s like an open wound, honest, a bit incredulous, determined. Nadal detractors mock his “false” humility, but in truth you never get the sense when he’s out there that he’s sure he’ll win; it’s more like he’s scared to death he’ll lose. That can drive you to achieve even more. Federer’s hauteur usually is explained, rightly or wrongly, like this: “Well, he’s Swiss”. But in his 30s, it has served him incredibly well. His tennis has served him well, too. Swiss winters meant plenty of fast, indoor hard court tennis from a young age, and he was on the tail end of a generation that made its money at the net. So he’s always had all the tools, all the shots. He also had the skill and imagination to use them. That Federer didn’t display that variety consistently throughout his career had more to do with the generations of tennis and court speeds he has played through. You look back at that 2001 match against Pete Sampras at Wimbledon, the only time they met, and you see a kid who served and volleyed on most points. As his career went along, his baseline game was enough to beat nearly everyone during his best years without even having to venture forward. Then came Nadal, and Djokovic, and the slower courts. Suddenly the baseline game wasn’t enough, the old-school racquet no longer up to the task. For awhile, Federer was stubborn; slowly, he came to the realization, even if subconsciously, that if he wanted to write the final chapter on his own terms he was going to have to throw caution, percentages, ego to the wind and just go for it. That’s what he has been doing this summer, and he has rolled to the US Open semis with hardly a stumble. It is part of his confident nature that not only did he think he could, he never seems worried about what might happen if he couldn’t. He seems as secure in his legacy as any athlete we’ve even seen. Nadal is at the opposite end. You could argue he’s talented enough to have been any kind of tennis player he wanted to be. But that’s not how it shook out. He’s a tennis phenom playing a grinder’s game - altogether incongruous, but now firmly embedded. From the clay-court tradition of his country, to the fact that he has had just one coach, one way, his entire career, Nadal hasn’t changed much even if he has improved everything he does. His game, then as now, is based on the confidence to execute it. That confidence, that nerve, is what’s missing. It would be exponentially harder for Nadal to do this than it has been for Federer, because he didn’t have those extra tools sharpened in the first place. So the attitude is understandable. But it banks on the fact that Nadal can get back somewhere near where he was while staying in his comfort zone. Nadal believes the only way to do it is by working harder, practicing harder, and then practicing some more. He’s healthy now. He said in Montreal that he sees the graph line of his 2015 season in an overall upward trajectory, despite some hiccups. That didn’t play out in New York, though. “The sport for me is simple, no? If you are playing with less confidence and you are hitting balls without creating the damage on the opponent that I believe I should do, then they have the possibility to attack,” he said after the loss to Fognini. “I am playing with little bit less mistakes than before. I have better feelings on the ball. Now remain to have again the speed, that extra speed on the ball, on the winner." It seems, to the outside observer, that he has lost a half step and doesn’t hit the ball from ideal positions as often, putting him on defence far too much. Nadal says that’s not the problem. “If you hit shorter, you will run slower. Is not you run(ning) slower, but the opponent tak(ing) the ball earlier so it looks like you are slower, no? Is easy to understand, easy to explain, difficult to change, but I going to do it,” he said. The premium competitor likely still has a few more chapters to write. Write him off at your own peril, just as those who wrote Federer off a few years ago are now feeling a little sheepish. If there’s a solution to be found, he’ll find it, or break himself in half trying. Who would have thought, when the teenager from Mallorca came on the scene, that the career trajectories of Federer and Nadal would keep intersecting, going in various directions? There no longer is a true rivalry because they meet so seldom – not in a year and half, never at the US Open, and not in a major final since Roland Garros in 2011. 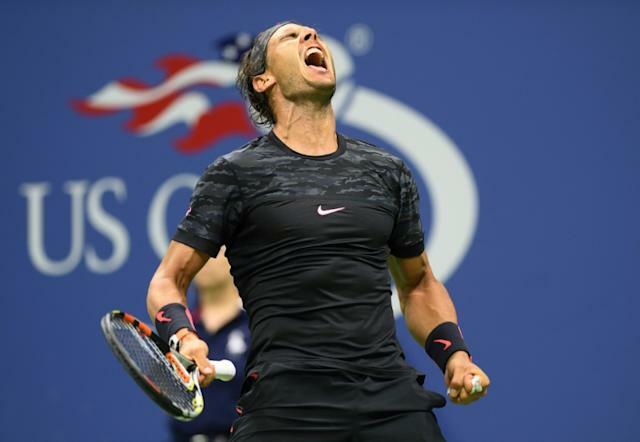 Nadal has won their last five meetings, four of them on Federer’s favoured hard courts. His struggles with injury and confidence cannot be disassociated with Federer’s late-career surge. The Swiss’s main rival these days is world No. 1 Novak Djokovic, against whom he is 21-20 in his career and against whom he matches up far better, tactically. But no matter what, Nadal and Federer remain inextricably linked. This final chapter of their careers, however long it lasts, will on some level be just as fascinating as the other phases have been. Everyone wants to see how a saga ends; this ending isn’t what most people expected. For now, it’s Federer who is taking centre stage on the biggest stage in tennis. But more chapters remain.